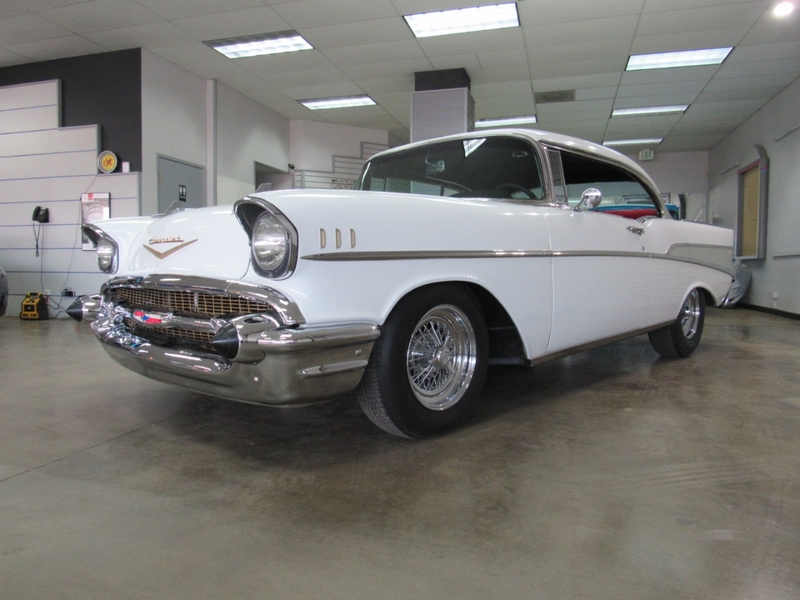 Used 1957 Chevrolet Bel Air for Sale in Denver CO 80220 Weisco Motorcars, LTD.
1957 Chevy Bel Air coupe same owner for the past 36 years and has been keep in a garage. Done in White over two tone Black & Red cloth this Bel Air gets looks of looks. Has a Chevy 350CI V8 with a turbo 350 automatic transmission and power front disc brakes that make this a very nice car to drive for cruise night. The body and paint are in very nice shape with no rust in the body and paint still looks very nice and all the chrome is in very nice shape. Has true chrome wire wheels with good tires. The inside is full custom with two tone Black & Red cloth with updated radio made to look stock and shows very nice. The drive train is also in very good shape and is in very good running shape and sounds good with the custom exhaust. This car will be sold Exempt on the miles due to age and with no warranty ask for more info by calling Weisco Motorcars to set up a time to stop by for a look over this 1957 Chevy.